In an effort to monetize the growing number of music videos on its site, MySpace has just launched a new pilot advertising initiative that places attractive overlays at the bottom of some clips, allowing users to buy the song they’re listening to or immediately jump to the artist’s homepage. The new initiative stems from MySpace’s partnership with Auditude, a content detection and management company that can identify copyrighted content and serve relevant advertising, even on user-submitted video. Now Auditude is applying the technology to music videos, which in the past have largely relied on banner ads and static text links to music stores for monetization. On Wednesday the site, in a partnership with Warner Music Group, placed an overlay ad on a video for My Chemical Romance’s cover of Desolation Row. Users were presented with the option to buy the song either on Amazon, or (in an interesting twist) on a vinyl disc. Over the 24 hours that the ad ran it posted an impressive 1.2% click-through-rate (significantly higher than rates seen on typical banner ads), encouraging MySpace and Auditude to expand the program to more videos. 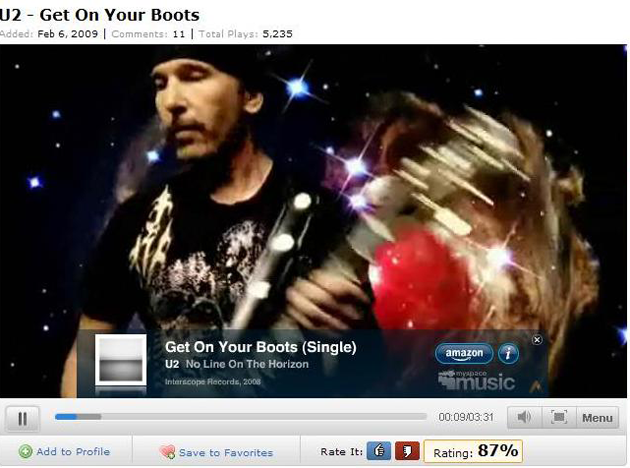 Today the site began displaying advertising on U2’s new single Get On Your Boots, with plans to expand the program more broadly in the near future. Much of the overlay’s success probably stems from the fact that it doesn’t look too much like an ad – it actually shows informative content like the album the song came from, the year it was released, and a link to the artist’s profile. I wouldn’t say I like having it there, but MySpace could have done a lot worse. And frankly in the current economic climate it’s encouraging when companies can find advertising methods that actually work without being ridiculously annoying. YouTube launched a similar program three weeks ago, allowing content owners to insert overlays for products into their videos (MySpace’s overlays are significantly more attractive, but they both serve the same purpose). YouTube wouldn’t provide any exact numbers, but a representative confirmed that in general the site has seen significantly improved clickthrough rates when ads are embedded in videos themselves, as opposed to appearing in surrounding banner ads.